Huge, state-financed infrastructure projects do little to boost the economy. For every rouble the state spends, only 40 kopeks remain in the economy. This year, the St. Petersburg International Economic Forum was devoted more to the global economy than ever — and for good reason. With Russia's economy nearing a standstill, exports declining and capital flight at a record high, organizers turned the discussion away from domestic problems in favor of global ones. 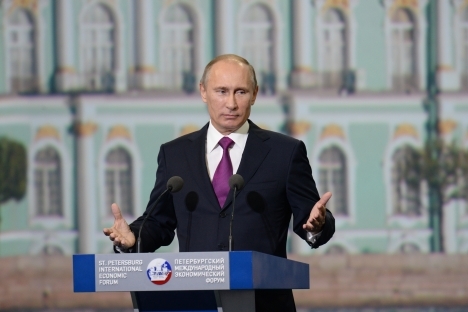 It is becoming increasingly clear that Russia's main problem is its poor leadership. Thus, it is no surprise that the country's leaders were not prepared to openly and honestly discuss that subject at the St. Petersburg forum. The authorities are constantly speaking of the need to increase economic growth, but their focus has only been on growing budget revenues and expenditures, which has little impact on the economy as a whole. For the first time in recent years, budgetary income is expected to plateau at last year's level of 12.8 trillion roubles ($398 billion). President Vladimir Putin is therefore becoming increasingly uneasy about his growing list of unfulfilled promises to increase social spending and is looking for ways to further increase budget revenue. Tax rates for small business and individual entrepreneurs have already been raised, and individuals will soon be taxed for the real estate that they own as well. As part of its overall effort to crack down on tax evaders, the Federal Tax Service is working to improve the system of collecting unpaid taxes from individuals and businesses. In addition, the authorities are trying to extract even more tax revenue from the oil and gas sectors, while Putin several weeks ago shocked many when he raised the possibility of replacing the flat 13 percent income tax rate with a progressive scale. In other words, the government is looking for new ways to raise income for the state. Reducing federal expenses, a measure that has been applied across the globe amid austerity programs, is out of the question for the Kremlin. Authorities are also considering possibilities for investing money from so-called rainy-day funds, such as the National Wealth Fund, to invest in mega-infrastructure and other construction projects. There are several reasons why state investment in these large projects will not boost economic growth. First, corrupt officials love to use these opaque projects to embezzle funds — in most cases, with full impunity. Second, these projects do not significantly increase the employment rate. For example, about 70 percent of the construction workers for the last APEC Summit were temporary foreign laborers who sent most of their salaries home. Third, up to 50 percent of the parts and equipment purchased are imported products, which does little to boost Russia's economy. Fourth, many large construction projects provide little or no ongoing stimulus to the economy after their initial use. For example,there will be few long-term benefits from the structures built for the APEC summit. In addition, several large facilities built for the 2014 Winter Olympics in Sochi will be dismantled after the games, and the structures erected for the 2018 World Cup will become money losers after the event is held. All of this means that for every rouble the government spends on such high-profile projects, only about 40 kopeks actually remain to support the Russian economy. In contrast to ventures undertaken in Western countries, these megaprojects provide little multiplier or ripple effect on the economy. Generous government spending, even when it reaches its intended targets, cannot replace private investment. For example, it is ridiculous to argue that a high-speed railway from Moscow to Kazan costing 928 billion roubles ($28.5 billion) would alone become the silver bullet to attract investment in the region. Likewise, it is unlikely that the proposed bridge from the mainland to Sakhalin Island at a cost of up to 600 billion roubles ($18.4 billion) will trigger greater foreign investment in the region's oil and gas industry. Russia will earn few long-term dividends from the 20 trillion rubles ($650 billion) to be spent on modernizing the military or on the government's large "investment plan" for developing the Far East. It is still hard to fathom that in the modern, technology-driven 21st century, Russia still lacks a highway between Moscow and St. Petersburg, despite the fact that spending on road construction increased 7.8 times between 2002 and 2012. Wouldn't it be better to start a more effective and accountable program for the private construction of those same roads and airports, giving private companies, including foreign ones, the opportunity to have full ownership rights? Notably, in Kazakhstan and Azerbaijan, where foreign investment is welcomed and better protected, oil and gas extraction is now 3 to 5 times higher than it was in the late 1980s. Wouldn't it make sense to allow for similar investment in Russia, where oil and gas production levels have yet to exceed Soviet-era benchmarks? The government should focus on reducing costs rather than constantly increase spending. Reducing the tax burden on small- and medium-sized businesses and other measures stimulating private initiative would do much more to spur an economic recovery, raise employment, increase entrepreneurial activity and, consequently, generate additional tax revenues. The overall tax burden in Russia has now reached about 40 percent of gross domestic product, a level comparable to that in Austria. In contrast to Europe, tax reductions in Russia would not likely lead to a corresponding increase in the national debt. What it would do, however, is reduce overhead costs for businesses, making them more productive, more competitive and more likely to generate taxable income. If the country is becoming wealthier, as we have been told, and spending is on the rise, why are we not seeing real economic growth? This is a question that cuts to the heart of Russia's systemic economic malaise, but it was clearly not an appropriate subject for the showcase economic forum in St. Petersburg. After all, if Putin never discusses this question during meetings with his ministers and advisers, why would he raise it during the forum? Vladislav Inozemtsev holds the international economy chair at Moscow State University's department for public governance.